Like everyone I was saddened to hear the news that Steve Jobs had died. In my nearly 20 years of working in a technical bookstore, I always thought we had three times as many PC books than Mac books, because there were three times as many users, including me. But over the years I came to also realized that most Mac users really did not need to buy an additional user manual . Macs were just that user friendly. When we got the first Mac to use in our store, I could not help to look for the rest of it. Where was the part that I usually kick my foot on under the desk? Last year the owner of our store, who always refused to use the stores computers, got an IPad. That small finger touch object, has transformed someone who I never thought would ever go near any computer product. 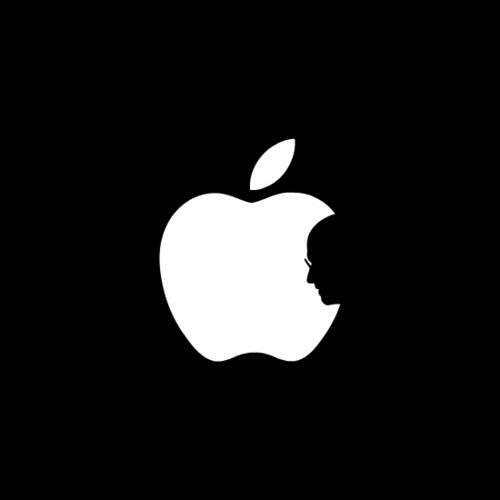 Steve Jobs helped reinvent our lives. He was a fearless visionary, who never stopped working. Being part of a small independent book business today, I feel struggle to keep up with the changes and always thinking about what it's like to have a real bookstore in today's ebook world. Taking a lesson from the work of Steve Jobs, we will continue to be fearless in tackling changes and continue to "Think Different". deficit - a fiscal success that quickly undoes the tepid economic recovery of the previous few years when the country stared down economic catastrophe. A prediction? No. An account of the years from 1936 to 1939 when unemployment and recession beat down the American economy after a young Franklin Roosevelt engineered in short-lived recovery during his first term. Manse and Frieden are not writing a cautionary tale. Theirs is a political history of the American economy of the last decade. Mining history, they predict that the coming decade of long recovery will be lost as well. The authors accept the debt story precisely described by Reinhart and Rogoff in 'This Time is Different' - the jumping point for their political narrative of the American economic story of the last decade. 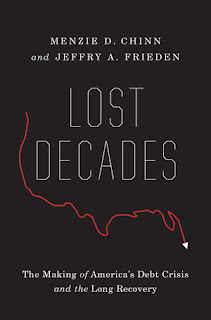 Lost Decades: The Making of America's Debt Crisis and the Long Recovery by Menzie D. Chinn and Jeffry A. Frieden, 9780393086509, Cloth, September, 2011, W.W. Norton & Company, Inc. Rob Carlson came to Reiter's Books on Wednesday evening, May 19, to talk about his new book, 'Biology is Technology,' published this year by Harvard University Press. Rob deftly pulled together a narrative of an industry that builds on biological processes to create and deploy drugs, fuels, feedstock, and more, much more. In fact, the core of synthetic biology is its openness to inventing an unlimited stream of products and processes. Rod used vivid examples to untangle the obstacles and potential of biotechnology - describing innovations already in the market and ones to expect. In doing so Rob describes how biotechnology fits into the intellectual property, economic, and public policy spheres. Vital cases tell the story. Even though drugs are on the market to treat and cure malaria, these drugs are expensive and out of reach of many of most sufferers. Production of the drugs using microbes in a process smaller to brewing beer dramatically reduces costs. In the absence of drug company initiative or public health commitment, the Gates Foundation stepped in as financier. But the Gates Foundation, with its billions, cannot step in to fund research on all drugs worthy of investment. Who decides? Is the decision too important for a market decision? And who funds and organizes drug delivery - year after year? 'Biology is Technology' is something of a misnomer as a title. The book and Rob Carlson's talk say this is not so. The subtitle hints at the complexity - The Promise, Peril, and Business of Engineered Live. Biology is as much a social project, raising issues of ethics, and public purpose. Rob Carlson is an industry insider who has an exquisite sense of how to step outside and see the big picture. Financial crises usually come as a shock. A shock to the economic system and a shock to the public. That financial crises also shock economists and policy makers is shocking as well. Carmen Reinhart chalks this up to an enormous blindness and delusion - a conviction that "it won't happen to us" because "this time is different." Carmen Reinhart and Kenneth Rogoff wrote This Time is Different: Eight Centuries of Financial Folly to counter this delusion. In a book that is at once elegantly written in a sharp, understated prose and massively documented, Reinhart and Rogoff puncture this delusion - but with little hope that they puncture it for good. graphed in the book are startlingly clear. Yet the hope that this financial crisis will shock us into action to prevent future crises is dim. This is a book for economists and for the rest of us. The book pays off a quick read. It also deserves repeated reading and reference to mine the depth of data pulled together and reconfigured for the book's argument. Carmen Reinhart nudges us on. The brief and intense discussion last evening is, we can hope, the prelude to a deep and far-ranging public discussion. Carmen Reinhart deserves a big stage. There are somethings we never get tired of at Reiter's. A good book is one, and another is the effort to keep independent stores alive. We are an independent bookstore. We've been in Washington since 1936 assisting people from all walks of life find the books they need to learn whatever it is they wanted to learn. From grad students at GWU, to the security guard at the front desk of our building, we try to do the absolute best that we can, when it comes to getting the right book for you. We've expanded over the last few years to try to encompass a much larger audience. Our children's section is expanding at a rapid click, to get young inquisitive minds going early, as is our selection of posters from small graphic designers and artists from all over, which bring a fresh trendy vibe to our store. And as much as we try to please the community, and have what it is people want, it's becoming a very steep uphill battle. While we won't do the gloom and doom story, it's very easy to imagine what it's like to be a small store in a sea of big stores and increasingly titanic-sized stores online. Add that to shape of our economy and we've pretty much gotten into the gloom and doom we didn't want to talk about. So, one day last week, while tweeting on our twitter (here), we stumbled upon this new thing that a wonderful person named Cinda Baxter came up with. 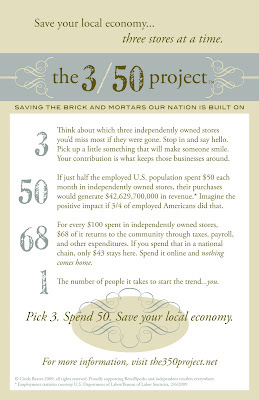 The basics of this "thing", called the 3/50 Project, is to help independent stores thrive without the added hostility that so many other projects have toward big box stores. Cinda asks participants to pick 3 independent stores they would love to see stay in business, and spend $50 in those stores each month. And according to her, just the commitment of $50 is enough to do wonders. We at Reiter's are fully on-board. We absolutely love this idea. Everyone on our staff has their own list of three stores and some of us have already gone over the $50 since we saw it last week. If you want to learn more about The 3/50 Project, visit the project's home page, go to Cinda Baxter blog, or search for it on google. And even if we aren't in you top-3, the good you do by being a part of this project helps us all in the long run. If you do not have RCN Cable or you do, but don't watch CNN, MSNBC, etc, then you probably haven't seen our new commercial. Fear not, here it is. Please tell us what you think. “When you look into the eye’s of a starving man, you are inflicted with a disease: a disease of the soul.” These words of compassion, and warning, were spoken to Roger Thurow, on his arrival to a refugee camp in Northern Africa, over fifteen years ago. 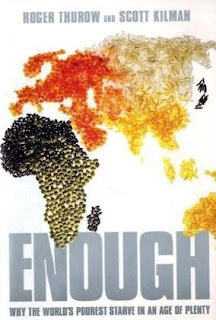 Thurow, a veteran foreign correspondent for The Wall Street Journal, has co-written an instructive and inspirational new book entitled Enough: Why the World’s Poorest Starve in an Age of Plenty. 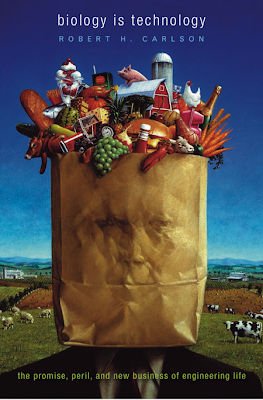 His co-author, Scott Kilman, reports on agricultural issues for the Journal, covering stories from biotechnology to food safety. Besides their credentials as journalists, both men are humanitarians at heart. Enough attempts to “outrage and inspire,” it emphasizes the importance of global food security and offers possible solutions to the multi-faceted problem. While the book was researched and written before the global financial crisis, the current economic instability worldwide adds urgency to an already pressing issue. Thankfully, some people are listening. The authors spoke to a packed auditorium at the Woodrow Wilson International Center for Scholars (located at the second biggest federal complex, after only the Pentagon) in downtown Washington DC, in order to publicize the problem, and their book. The event was sponsored by Reiter’s bookstore, an independent bookstore located on 20th and K Streets, not to far from the Wilson Center. The author’s signed copies of their book to be sold at Reiter’s bookstore, at no extra charge, in order to raise awareness. Thurow pointed out the importance of reaching beyond “the saloons of Washington,” and spreading the word to the grassroots American public. Both Thurow and Kilman have traveled extensively in Africa and South Asia, witnessing the horrors of hunger firsthand. For those without the opportunity to travel and see for themselves, reading this book would be a worthwhile step in understanding the multi-faceted problem. And understanding, Thurow and Kilman remind, is the first step toward fixing. “It’s no War and Peace,” Marc Anthony Viola declared, with surprising honesty, of his own book, A Spy's Resume on July 23rd, “It’s not the best book in the world.” Viola spoke to a small crowd at the independent Reiter’s bookstore downtown, on the corner of 20th and K Street. While no Tolstoy, Viola, with almost twenty years experience in the US intelligence community, suggests that the book is a valuable tool not only for veterans leaving the service, but anyone seeking a new career. With two further books in the works and deals for two more, Viola seems to be a qualified success-story. In our fast-paced modern society, Viola stressed the need to take time to do nothing. He joked that while writing his first book, he was doing “nothing", but "couldn’t believe how much he was getting done". With ambitious, overly-motivated yuppies around every corner, Viola’s advice is a reassuring breath of fresh air. We all should listen. 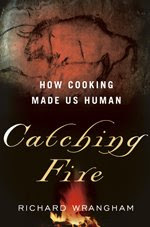 In his provocative new book, Catching Fire, Richard Wrangham, a biological anthropologist at Harvard University suggests that early hominid evolution owes as much to the idea of “Man the Cook” as it does to the notion of Man the Hunter. The Man the Hunter hypothesis, currently favored among many anthropologists as one of the main drivers for early hominid development, holds that this development came about due to an increase in meat eating by the australopethicines, leading eventually to the evolution of Homo habilis. Wrangham suggests that it was not simply meat eating, but the addition of cooked food of all sorts to the diet which led to the subsequent evolutionary leap from the habilines to Homo Erectus and anatomically modern humans. He provides a wealth of information on the ways in which cooking led to anatomical changes such as increased brain size, a decrease in the size of the teeth and gut, and an increase in efficiency of digestion. Increased nutritional value obtained from cooked food, both meat and vegetable, led to further evolutionary changes. In addition, time which was, as Wrangham makes clear, once used to obtain, chew and digest raw foods could now be spent on other things such as hunting and socialization. Supplemented by a large and highly detailed end notes section and an extensive bibliography, this readable and informative new book is sure to be of interest to anyone following new developments in the study of hominid evolution. Wednesday the 20th here at Reiter’s was an exciting day. The large convention in town, the 2009 Homeland Security Science & Technology Stakeholders Conference, drew a number of science fiction writers as well as scientists to Washington, so for one night Reiter’s decided to expand our science books to include select titles of science fiction from 11 different writers in the genre. 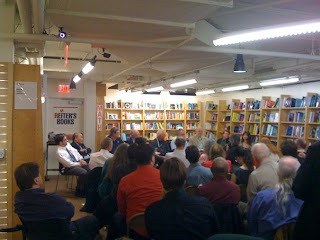 Then we invited the 11 different sci-fi authors to come to the store and hold a discussion the night of the 20th. The gathering was a big hit with lots of lively discussion with the authors, snacks and drinks, and a large crowd of sci-fi fans. We even had a Washington Post reporter in attendance and an article mentioning the event on the front page of the Style section of the Washington Post. The Sci-fi night, as we here at Reiter’s like to call it, was a big hit and is an annual event here, so if you missed it this year or came and enjoyed it remember to stop by next year for more great science fiction and discussion with the authors of your favorite books. Law-abiding outlaws. Ferocious constitutionalists. Rational cutthroats. Peter Leeson spun tale after tale of early 18th century pirates at Reiter's Books on Wednesday evening, May 13, 2009. It wasn't the usual story. Peter Leeson is an economist at George Mason University and his book, The Invisible Hook,crisply sorts out the roiling contradictions of early piracy. Pirates, he said, organized their ventures and regulated their crews as profit maximizers, responding rationally to economic incentives. Pirate crews wrote and unanimously adopted constitutions that circumscribed powers of pirate captains, regulated the distribution of pirate booty, and compensated pirates injured on the job - all that more than half a century before the U.S Constitution. Were pirates social progressives? Atrgh! Leeson mines pirate chronicles to show how pirate antics were dryly clear-headed economic actors. Everyone has heard the story of the independent bookstore closing its doors. So much so, that one can't help but roll their eyes at yet another "Death of a Bookstore" story. Now, we at Reiter's have no plans to be in such a tale, and many of our Indie-brethren feel the same way. So, we (the Indie Community) are glad to be putting forth BuyIndieDay. On May 1st, independent bookstores across the nation are asking all those who love us to buy one book. Whether its hardcover, paperback, fiction, or non-fiction, we are asking you to come out and support indie. If you'd like to check out more about IndieDay 2009, please visit Kevin Guilfoile's blog entry at The Outfit, which is a really cool blog you should check out if you have the time. For those who haven't fully cultivated a love for Indie Stores, please look at the list below to see all the benefits of buying Indie. When Jenny Beorkrem couldn't find a neighborhood map of Chicago that suited her tastes, she decided to make her own. Using her graphic design background Jenny put together a cool little map that blended amazing typography techniques with map functionality. When completed, she thought that others might love her new map, so she began Ork Posters. Branching out past Chicago, Jenny now makes posters for other major cities, with more on the way. They come in a variety of colors with a variety of cool names....like "Crackberry" (those that know a little Washington DC history might find that one a little funny) and "Brooklyn's Finest" (for the die-hard Brooklynite). We at Reiter's fell in love with the DC posters, but with over 40 different ones to choose from, we're sure you'll find a poster to fall in love with too. So stop by our store and check out the whole collection. 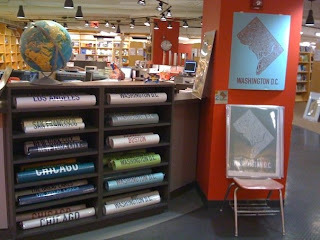 Located in the heart of our nation’s capital on the corner of 19th & G Street N.W., Reiter’s Books is a treasure for DC’s great minds and big thinkers. Established in 1936, Reiter’s is one of a few booksellers in the world that is focused on bringing scientific, medical and technical books directly to the community. From finance, economics, math and medicine to design, architecture, politics and policy, Reiter’s has what you’re looking for. We also carry Littmann Stethoscopes, Welch Allyn Diagnostic Sets and other pocket medical equipment and puzzles, games and toys for thinking children of all ages. When you shop at an independently owned business, your entire community benefits. Buying local means less packaging, less transportation, and a smaller carbon footprint. Local retailers are your friends and neighbors—support them and they’ll support you. More independents means more choice, more diversity, and a truly unique community. K.WIGGINS 2011. Picture Window theme. Theme images by luoman. Powered by Blogger.